For most of us attitude to “radiation” is quite negative because of its ability to adversely affect human organism. But are we in a position to avoid it totally? Radiation comes from radioactive isotope or radioactive nuclide, which are atoms having excess nuclear energy and thus unstable while, radiation is a flow of particles, which are capable of ionising neutral atoms and molecules, i.e. to turn them into particles having electric charge – ions. 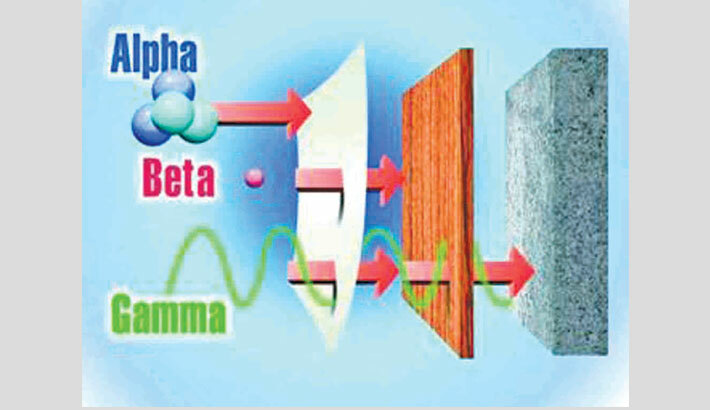 The main types of radiation emitted by radioactive nuclei are alpha radiation – stream of high-energy alpha particles; beta radiation – stream of beta particles (electrons е– or positrons е+), with high energy and gamma radiation – stream of gamma quanta (penetrating electromagnetic radiation). Human body is constantly exposed to radiation – starting from the period of prenatal development; but how and from where? It is a common perception that the biggest source of radiation is nuclear industry (NPP operations, manufacturing of radiochemical, radiation incidents, testing of nuclear weapons, etc.). But in fact the major part of annual radiation dose we receive comes from the sources that have nothing to do with the nuclear industry. Any object, any item around us, including air and drinking water contains natural radioactive isotopes. Natural radioactive nuclides are responsible for 72 per cent of the total annual exposure dose. Natural radioactive nuclides include potassium-40, lead-210, polonium-210, radium-226, radium-228, thorium-230, thorium-232, uranium-238 and several others. Thus, the largest part of annual dose is associated with natural isotopes. Among the natural isotopes, the biggest share can be attributed to radon (radon-222), radioactive noble gas, which is created in the process of decay of another natural radionuclide – radium (radium-226). Soil or construction materials contain radium-226. Radon does not reside in construction materials, but escapes into the air. It enters human body through the lungs with air and carried with blood to organs and tissues, causing internal exposure. After the natural isotopes medical examination procedures on an average accounts for 14 per cent of the accumulated dose. Medical equipments are constantly getting improved, and nowadays patients get much less dose during radiological diagnostics than before. Earth atmosphere is always exposed to cosmic and solar radiation. Components of the primary cosmic radiation are electrons, protons and alpha-particles reach earth atmosphere. Interacting with atmospheric gases, they generate secondary cosmic radiation, which is represented by gamma photons and so-called mu mesons. The share of cosmic radiation in the annual dose is about 14 per cent on average (at the sea level about 7 per cent). Radioisotopes, produced by nuclear industry facilities are called ‘artificial’ or ‘anthropogenic’. What is the place of this anthropogenic radionuclide in the overall picture? It is the last in the line – one fourth of a per cent of the annual dose. Importantly, this figure takes into account radiation incidents as well as nuclear weapon testing. When human body is exposed to radiation, the process of ionisation takes place directly in the cells of tissues and organs; if the source of radiation is powerful enough, the consequences may be very unpleasant. Earlier it was believed that the main damage is caused by harmful influence of radiation on cell nucleus containing genetic material. But it is now proven that genes are capable of withstanding high radiation doses, while water – not so much. What does it mean? A human body cell contains 70 per cent of water, in brain cells it reaches up to 90 per cent. When a radiation particle hits a cell, the probability of its interaction with water molecule (Н2О) is very high. The ionised molecule (Н2О+) and ‘teared’ electron (е–) interact with other molecules, producing so-called free radicals. The radicals, in their turn, participate in chemical reactions. Ionising radiation produces xenogenic, chemically aggressive compounds within a cell. If those compounds are produced in overpowering quantities, the cell dies. It must be noted that this happens only when dose is significant. In case of a minor exposure the radiation damage is repaired by the self-regulatory and self-regenerative mechanisms of a living organism, enabling to cope with injuries without long-term consequences. According to the so-called ‘threshold hypothesis,’ if the received dose is below the threshold, there is no threat to human health. By the way, the threshold level is quite high- according to the toughest assessments; it is 100 millisievert (mSv), by milder assessments – 500 mSv. But the regulatory documentation sets the maximum permissible dose on much more stringent levels – tens and hundreds times lower (! ), though there is no scientific evidence of any harmful effects of small radiation doses (below 100 mSv). Radiation can easily be measured unlike a wide spectrum of harmful chemicals, which enter human body with air, water or food. Specialised instruments (dosimeters) are commonly used for measuring the effective dose or dose rate. Even ordinary people can afford to buy such a relatively inexpensive instrument. The writers are Senior Lecturers at St.